It's been a while since I ordered a new Aerogarden Seed Kit--actually I haven't gotten a new one since Miracle Gro made their investment in AeroGrow and started rebranding all the Aerogardens accordingly. 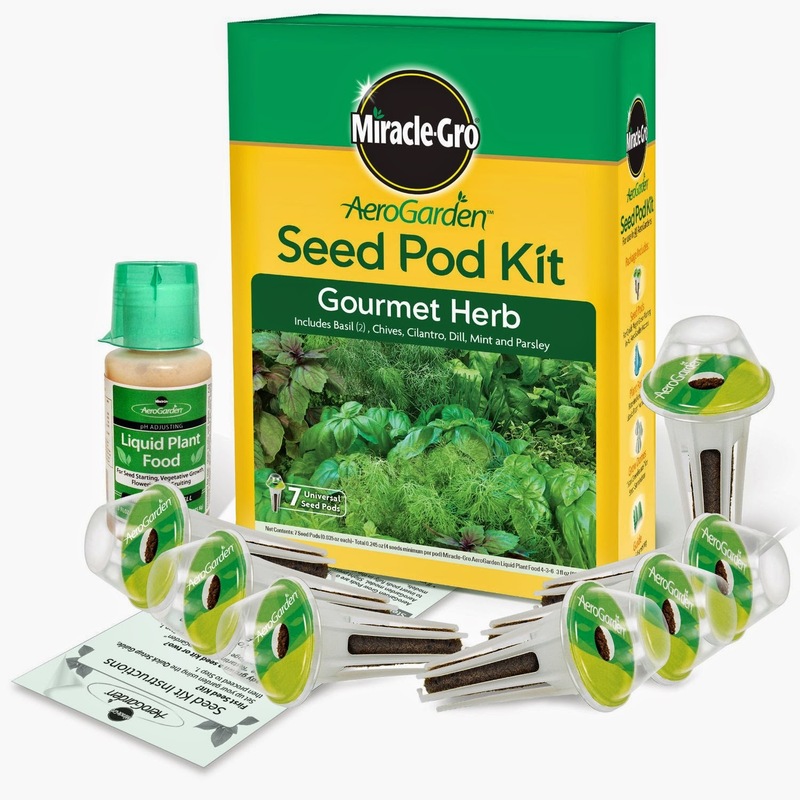 I just noticed that the new, re-branded herb kits are selling on Amazon, labeled as Miracle-Gro AeroGarden Gourmet Herb Seed Pod Kit (7-Pod) . It looks like they're pretty much the same old seed kits that they've been selling for years, although I notice they have a jar of liquid plant food now, a big improvement those awful plastic packets that always ended up drying out (to use them I'd always chop them up in a glass measuring up, stir to get the nutrients liquified again, and pour into my Aerogarden). Gourmet Herb (which includes Genovese Basil, Thai Basil, Mint, Cilantro, Parsley, and Dill). This one never fails to get results and interestingly, they've removed Sage, Thyme, and Chives; those first two were always the trickiest of them to grow well. Catnip. You still can't grow that other medicinal herb in most states, but at least you can help kitty get her fix! Fresh Tea (including lavender, peppermint, lemon balm, and lemon mint). On my list to try some day. Chili Pepper (Jalapeno, Red Fire, and Purple Super Hot peppers). Again, I had some really good results with these. Salad Greens (Red and Green Leaf, Butterhead, Romaine lettuces). If you recall, I tried these but it was a bit on the disappointing side. Pricing for these seed kits are around $15.95-$17.95, or roughly the same as on Aerogarden.com. The nice thing about being on Amazon.com is that if you order two of them (or basically order anything else that adds up to $35), you'll get free shipping, which was always one of the things that killed it for me on the Aerogarden site. Aerogarden does honor the 100% Germination Guarantee--as you've seen in posts in the past, they can get a little technical with honoring this, but for the most part they'll be good about it. Also, if you're collecting free Amazon gift cards using a service like Bing Rewards (and if you're not, I suggest highly that you do), in just a few months you can earn enough points to trade in for multiple Amazon gift cards so you can get one for free!